Read this if you use an ASUS 3rd party router (i.e. not the BT HomeHub) and, you are receiving the IPC6023 error on BT TV when trying to watch internet channels. Funny thing is, your BT Player works fine and so does apps like BBC iPlayer. I’ve come across a solution that worked for me from one of the posts in the BT Community site. It took me ages to find so hopefully you find this specific post easily! There are lots of posts out there that mentions if you are using Powerline or not, I am using Powerline adapters and I got my internet channels working. 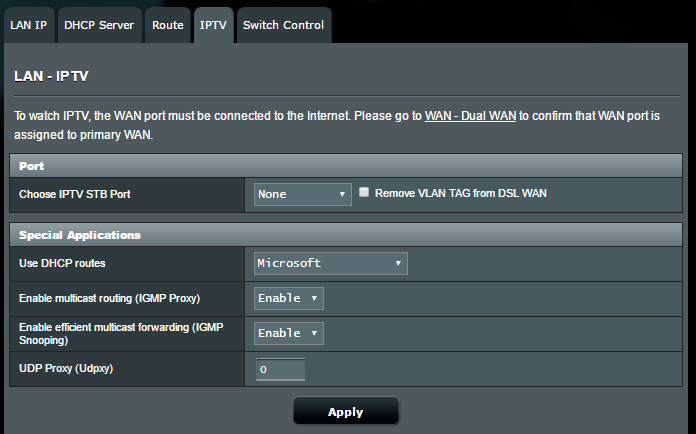 I’ve got an ASUS DSL-AC68U router and there are a couple of settings within the admin pages that I turned on to make it work. Leave the other settings as below. As soon as the settings were applied, I tried the BT internet channel and it worked!